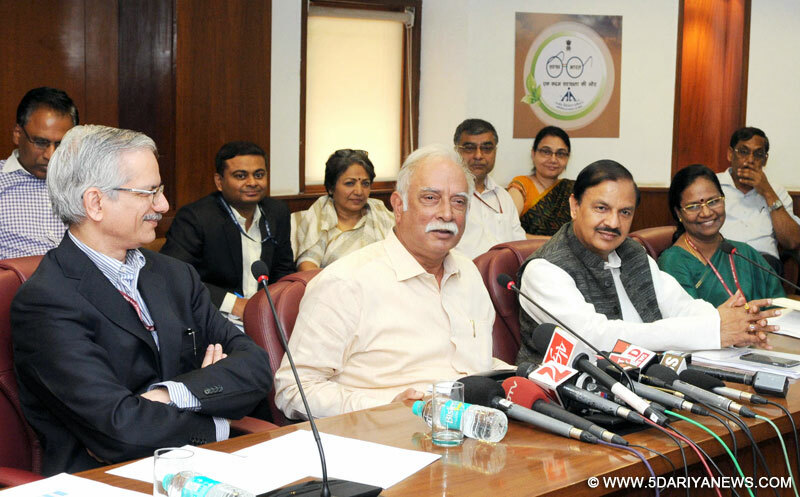 Ashok Gajapathi Raju Pusapati addressing the media about the Budget related issues, in New Delhi on March 02, 2016. The Minister of State for Culture (Independent Charge), Tourism (Independent Charge) and Civil Aviation, Dr. Mahesh Sharma and the Secretary, Ministry of Civil Aviation, Shri R.N. Choubey are also seen. The latest national budget can potentially make India an Asian hub for sophisticated overhaul of aircraft, Civil Aviation Minister P. Ashok Gajapathi Raju said here on Wednesday.The business of maintenance, repair and overhaul (MRO) is a Rs.5,000 crore market in India now. "The budget has made provisions for incentivising domestic value addition to help 'Make in India'," the minister said, while listing out the provisions that particularly aid the MRO business at a press conference here. "The MRO business of Indian carriers is around Rs.5000 crore. But 90 percent of that is currently spent outside India -- in Sri Lanka, Singapore, Malaysia, UAE," Raju said. "Given our technology and skill base, the government is keen to develop India as an MRO hub in Asia, attracting business from foreign airlines while retaining the domestic business. The budget provisions will go a long way in realizing this aim." - Restriction that levy-exempted parts be used within one year removed. - Such aircraft allowed to carry passengers at the beginning and end of stay period in India. This apart, Raju said, the budget also aims to revive the unserved and under-served airports in the country for increasing the country's regional connectivity. It provides for the central government to partner with states to develop some of these airports and airstrips in the country.The minister said from next year a single customs window project will be implemented at major ports and airports, which will reduce the dwell time of cargo by bringing all regulatory agencies under a common platform.